Gov. Pence marks start of Indiana-Kentucky bridge: Indiana Gov. 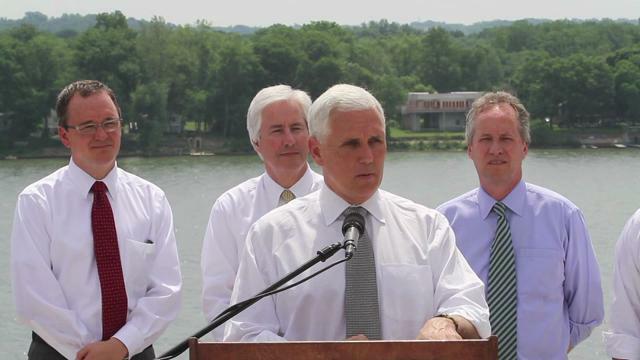 Mike Pence said, “Now we’re rolling our sleeves up and … we’re going to get this East End Bridge done.” He was with state, local and federal leaders in Utica, Ind., on May 29, 2013. UTICA, IND. — Indiana Gov. Mike Pence pledged Wednesday that a new Ohio River bridge east of Louisville, Ky., will be built under budget and on time, as decades of talk is turning into action with construction starting on the span that will connect Indiana and Kentucky. Standing on a bluff overlooking a wide stretch of river where the East End Bridge will go up, Kentucky and Indiana officials applauded the cross-river cooperation that overcame financial obstacles for a project that has been discussed since the late 1960s. Pence said the bridge, carrying a construction price tag of $763 million, will promote job growth and opportunities that play to the region’s strengths. After months of site preparation and pre-construction work, crews will begin actual construction work next week, officials said. On the Kentucky side, traffic pattern changes and excavation will ramp up in coming weeks in the area. Workers have already cleared a path to make way for what will become a tunnel and an approach to the bridge on the Kentucky side. Construction work on the Indiana side will become noticeable later this summer. The crossing is expected to open for traffic in the fall of 2016. “We’re going to continue to drive this project forward to make sure that we finish on time and under budget,” Pence said. Sid Florey, an executive with WVB East End Partners, the consortium chosen to design and build the East End bridge, promised to deliver on the expectations set by the region’s political leaders. The group is committed to tapping into the local labor pool to help build the bridge, he said, and the builders want to cause “the least amount of disruption” to motorists. The $763 million bid from WVB East End Partners was 23 percent below the project’s previous $987 million cost estimate. Indiana is overseeing construction of the East End bridge, which will complete a loop around Louisville with a cross between Utica, Ind., and Prospect, Ky. The bridge is one of two new Ohio River spans that will be built in Greater Louisville. Kentucky officials are handling construction of a second bridge for Interstate 65 that will connect downtown Louisville and Jeffersonville, Ind. The new downtown bridge, also expected to open in 2016, will carry northbound traffic on I-65. The existing Kennedy Bridge will be used for southbound I-65 traffic. The downtown work will include reconfiguring an often-clogged interchange where three interstates converge. Construction of the downtown bridge is expected to start around July 1. Motorists will pay tolls to use all three of the spans after the project is completed. Pence told reporters that he was confident that officials found “the right financing structure” for the project. “Today is going to be looked upon as an important day in the economic history of this region,” he said.